Coenzyme Q10 (also known as ubiquione and ubidecarenone) is a vitamin-like substance which plays a vital role in the body's energy supply mechanism, acting alongside enzymes converting fats and sugars into energy. All body cells require a supply of Q10, with the heart and muscle cells having a particularly high energy requirement. This patented preparation delivers coenzyme Q10 in the active formula that has been documented in more than 80 scientific studies to provide a consistently high level of bio-availability. 1-4 capsules per day or as directed by a physician. To be taken with food. Bulking agent: Vegtable oil, Capsule Shell: Fish Gelatine, Co-enzyme Q10, Humectant: Glycerol, Colour: Ammonia caramel, Humectatnt: Purified water. Do not exceed recommended amount.Contains fish products.Not suitable for vegetarians.Pregnant and lactating women and those on medication should seek professional advice prior to taking supplements. 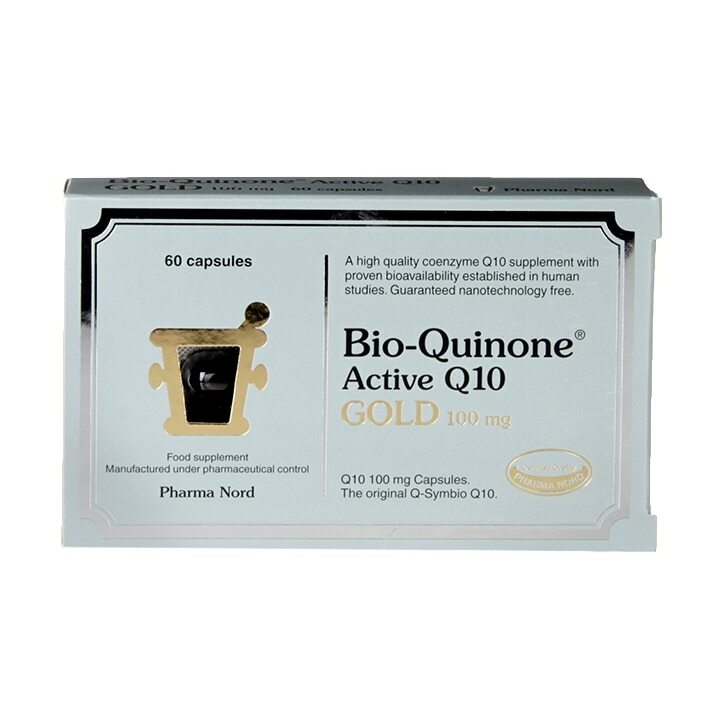 Pharma Nord Super BioQuinone Q10 Capsules 100mg is rated 5.0 out of 5 by 8. Rated 5 out of 5 by Coco6537 from Nice product I bought this product for my mum and She has been eating it for 5 years. Rated 5 out of 5 by Alix37 from Used for years! Used these capsules for years, wouldn't change brands. Rated 5 out of 5 by lacala from Finally something that works for energy! It took about 7 days to notice a difference but this has helped to boost my energy levels and I’m certainly not as tired as I usually get. Will keep using this supplement. Have tried many different ones in the past for energy & fatigue without much success but this is worth every penny for me for the difference it’s making. Rated 5 out of 5 by Jenny2 from Availability Product is good getting hold of it in your stores impossible !!!! Rated 5 out of 5 by sheba from Good quality I am pleased with the product and quick delivery. The ordering process on line was simple.